WASHINGTON — The U.S. Navy conducted a failed ballistic missile intercept Wednesday with its SM-3 Block IIA off the coast of Hawaii. 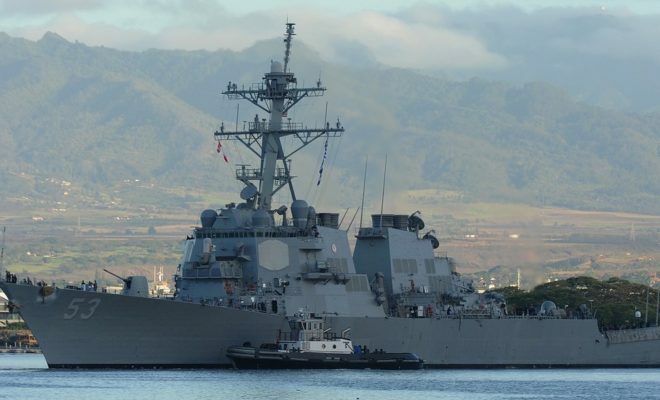 The destroyer John Paul Jones, running the Navy’s top-of-the-line Aegis Baseline 9.C2 combat system, failed to intercept a medium-range ballistic missile launched from the Pacific Missile Range Facility at Kauai, Hawaii. The destroyer detected and tracked the target on the AN/SPY-1 phased array radar but was unable to intercept it. It was the second test of this latest iteration of the SM-3. The John Paul Jones successfully shot down a target in February with it. That test was the first intercept using Baseline 9.2C. “Program officials will conduct an extensive analysis of the test data,” a news release for the U.S. Missile Defense Agency said Thursday. The test also marked the fourth flight test of the SM-3 Block IIA and the second time it was launched from a ship. John Paul Jones is the Navy’s missile defense ship; it replaced the cruiser Lake Erie in 2014. Lake Erie was the test ship since 2000 and is currently on deployment in the Asia-Pacific region. The missile is being developed by Raytheon and is a joint project between the U.S. and Japan, designed to counter rising missile threats from North Korea.